DereDere will soon be participating in the Asian Market Festival in Stockholm on the 12th September. With that in mind, I’ve been doing research on the theme of the market, the Luoyang city and the Tang Dynasty in China. Since my interests run mostly towards Japan and Korea, I’m not very familiar with the Chinese culture. But this particular topic has awakened my appetite for more inspiration from that period. If you want a short summary on the Tang Dynasty (618 – 907), check it out on Wikipedia. Since I’m looking for jewellery inspiration, I’ve been mostly reading about women’s roles in that society, their fashion and a very stylish muse in particular, Empress Wu Zetian. But let’s take it one at a time. I wasn’t very impressed about the treatment of women back in those days, but fair enough, we’re talking about Medieval Confucian time, so it can’t really be helped. What was interesting though, was that some women managed to beat the system now and again and go out and behave like tomboys if they wanted. According to one source, they would jump the walls of their houses and go sightseeing or horse riding with other men. Doesn’t that sound positively like straight out of a romance novel ^.^ ? Then the clothing is absolutely cute during the Tang Dynasty. It looks a bit like a combination of Korean hanbok meets Empire style ( way before the Empire period that is) , with long flowing silk dresses. Oh, and let’s not forget all the funky hairdos of that time. I wonder how much time they put into it? And did they actually invent hair gel already to hold those Mickey Mouse ears arches in place? I MUST try some of these out. Anyone know any good YouTube video tutorials for something like this? Which brings me to the most stylish one of them all, Empress Wu. Apparently she’s a very controversial figure in history, accused of all sorts of intrigues and misdeeds. Frankly, in my opinion, that’s probably just those pesky male historians that didn’t know what to do with her. My image of her is the character played by Fan Bing Bing in the drama The Empress of China. It’s on my list to watch at some point, because I’m pretty sure it is a wonderful series, visually at least, with all those amazing outfits. 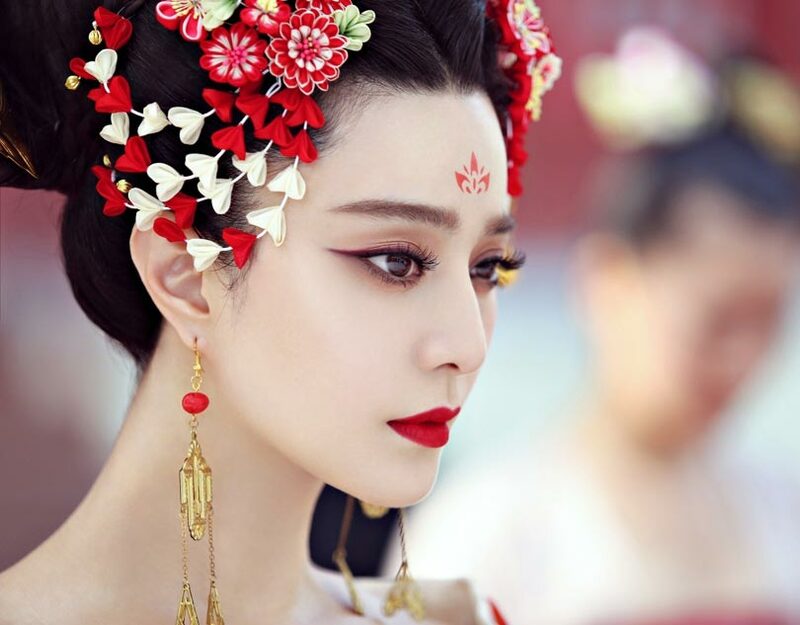 Plus, I really like Fan Bing Bing, ever since I saw her in The White Haired Witch of Lunar Kingdom. Well, that was a long introduction to what DereDere goodie I managed to make for my muse. I went for high quality AA freshwater pearls and gold with a little bit of spark added to the mix. If the head pieces were such intricate affairs, I thought I’d keep it short and clean for the wrist. And voilà, I call this bracelet Underwater Pearls and you can find it on our shop here. Don’t forget, if you’re in Stockholm on the 12th September to drop by the market to say hello to us.